View More In Artificial Snow - Page 6. 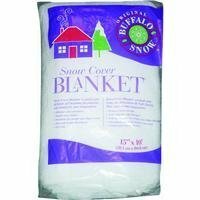 LEGGETT & PLATT-Buffalo Snow: Snow Cover Blanket. This snow-like material is perfect for all kinds of holiday decorations including tree trim; mantle snow displays; table-tops and centerpieces and more! This package contains one 10 feet long by 15 inches wide snow blanket. Made of 100% polyester and is flame retardant. Imported. If you have any questions about this product by Buffalo Batting, contact us by completing and submitting the form below. If you are looking for a specif part number, please include it with your message.